This picture is of Joey after we heard that the Wiener Mobile was in town. Strangely enough, though, today's story isn't about her. Mainly because she was not the one who was excited to tears by the whole experience. Aurora: Today is the Best Day Ever! I went to the grocery store and I saw the WIENER MOBILE! I didn't want to run right up to it and seem too excited, so I decided to go shopping first. But then I started to freak out that by the time I was done they might be gone. The whole time I was inside the store I kept saying to myself, "Be cool, be cool." Wendy: You were crying weren't you? Aurora: I was trying not to. 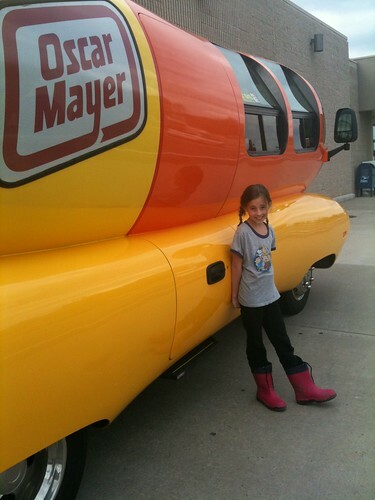 Aurora: So I finished shopping and asked the wiener mobile people if I could have a picture. The lady didn't understand and thought I wanted to take it of just the wiener mobile. 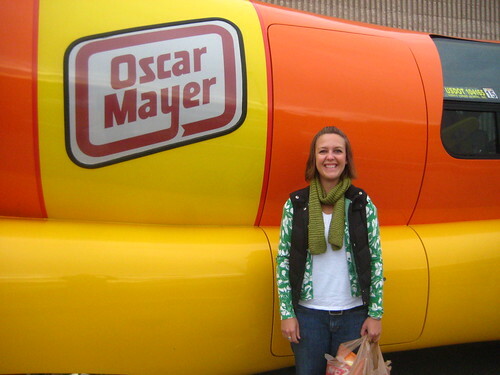 So I had to explain that No, I wanted a picture of me standing next to the wiener mobile. Aurora: Then I asked for an Oscar Mayer Wiener Whistle. Jenny: I didn't know there was a such a thing. Jenny: and crying by this time, right? Aurora: Oh yah, totally. So I was so excited (and crying) that I couldn't remember the words, so they had to whisper them to me every other line. But I got my whistle! Wendy: Probably because they thought you were a special needs person. After you left, I'm sure they even remarked on how high-functioning you were. Aurora: Yah, something like... Oh good for her. She almost remembered all the words to the Oscar Mayer wiener song. Love you, Rora. Your enthusiasm for life really does make you special. Yah, special as in I really do need to wear my helmet more often. Ha! Thanks for appreciating my weirdness. Dave Barry, an author that I may or may not have stalked occasionally, got the chance to actually DRIVE the weinermobile once. He picked his son up from middle school, announcing the kid's name on the loudspeaker. He was delighted to be able to embarrass the boy in such a BIG WAY. I laughed SO hard. Awesome. I will admit to a bit of giddiness when i saw the weinermobile in person but i was too embarrassed to sing the song for the whistle. Your cousin Aurora is super awesome!!!!! I know I commented already, but I have to say that I'e re-read this several times just for the chuckle that happens every time I read it. HAhahahahHAHAHA!!! I love it so much because HELLO I would totally be that special adult in the parking lot of the Safeway or whatever trying to make my way through the Oscar Mayer weiner song to get my whistle. I can sing the bologna song, too, but I'd be afraid to find out what the prize would be. OH. MY. LORD. 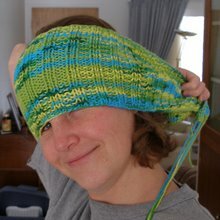 I have never laughed so hard at a blog post, EVER. 'High-functioning' indeed! (I also have a picture of the wienermobile, but alas, only in front of me at the turnpike gate, not with my actual person.) Wendy, I love how you tell the story, and Aurora--you weren't the only one crying here!